Characteristics, such as microbial biomass, basal respiration, and functional diversity of the microbial communities, were investigated in paddy soils located in Bandung, West Java Province, Indonesia, that have been heavily polluted by industrial effluents for 31 years. Paddy soil samples (10–20 cm) were taken from two sites: polluted soils and unpolluted soils (as control sites). The polluted soils contained higher salinity, higher sodicity, higher nutrient contents, and elevated levels of heavy metals (Cr, Mn, Ni, Cu, and Zn) than unpolluted soils. 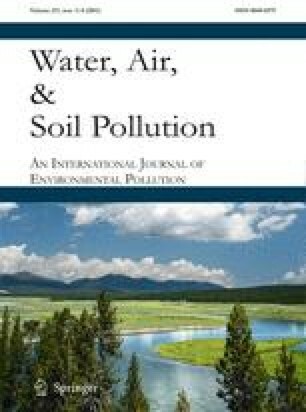 Soil physicochemical properties, such as maximum water holding capacity, exchangeable sodium percentage, sodium adsorption ratio, and swelling factor, in polluted soils were much greater than those in unpolluted soils (P < 0.05). Changes in the physical and chemical soil properties were reflected by changes in the microbial communities and their activities. BIOLOG analysis indicated that the functional diversity of the microbial community of polluted soils increased and differed from that of unpolluted soils. Likewise, the average rate of color development (average well color development), microbial biomass (measured as DNA concentration), and the soil CO2 respiration were higher in polluted soils. These results indicate that major changes in the chemical and physical properties of paddy soils following the application of industrial wastewater effluents have had lasting impacts on the microbial communities of these soils. Thus, the increased activity, biomass, and functional diversity of the microbial communities in polluted soils with elevated salinity, sodicity, and heavy metal contents may be a key factor in enhancing the bioremediation process of these heavily polluted paddy soils. This work was supported by a grant from the IA-ITB (Ikatan Alumni Institut Teknologi Bandung), Indonesia. We are grateful to the ZALF Central Laboratory, Germany, for soil chemical analysis, and all the students of the Toyota laboratory for their assistance and cooperation. We also thank the anonymous reviewers for their constructive comments. SKC would like to express her thanks for the fellowship provided by the IDB during her postdoctoral research at the Department of Microbiology, University of Georgia, USA (2008-2009).